Lazada is constantly growing & has gained the status of the biggest and the most modern online store in Thailand. All that convenience now available in English. Lazada is a popular e-commerce website founded in 2011. Now operating in six Asian countries, including Thailand. Since 2013 it added a marketplace feature where third-party retailers can sell their own products through the e-commerce portal. The success has been overwhelming and the marketplace now constitutes for the most of sales on Lazada. Shopping categories include Electronics, WOmen’s Fashion, Men’s Fashion, Home & Living, Health & Beauty, Baby & Tours, Sports & Travel, Motors, Pets & Media, Highlights Shop Brands and more. 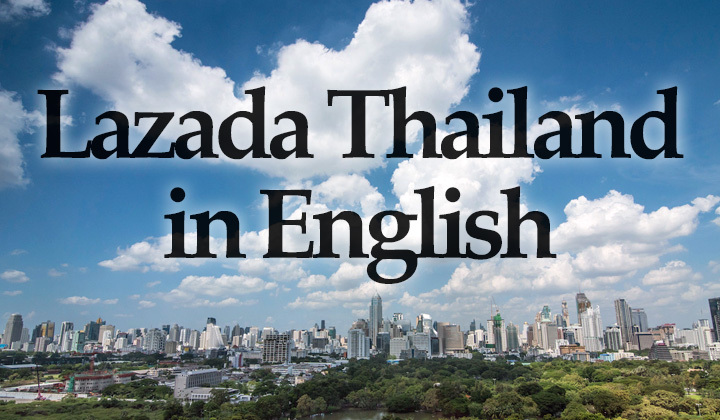 The Thailand version of the website, targeting online Thailand consumers is located at the address lazada.co.th and contains both versions in Thai and English language. International shipping is not supported so far. Please, see the link above to change the language setting. However — do note that the product descriptions remain in Thai. The easiest way to convert the descriptions into English is to use the Google Chrome web browser which automatically asks to translate pages that are not in the same language as the browser itself. In this way, you can effortlessly browse through the pages while Thai content is live translated. Warning! Although very helpful, the translation is far from perfect. So despite using the translation feature — it is recommended to use the link above before entering the site in order to have all the important text in correct English. If you have any questions about online shopping in Thailand. Simply leave your question below and I’ll get back to you soon. Thank you. I have a manufacture and store in thailand. We sell clothing for kids (dress, t-shirt, skirt…) 100% cotton . We would like to sell on lazada. Also after inscription we need to send you our stock with the prices? And about the deliveries and payment. Please send us all informations for can to sell on lazada. Yes freezers are available for oder. Just use the link above to search for a suitable freezer, add to cart and go through the registration steps. Thanks! I am looking for a box to use with my tv to watch English football. I live in Chiang Mai Thailand. ive been trying to send a fridge to some dear people in Thailand ( im in the US ) somehow my visa card doesnt work ? its from my bank, not a pre paid. why is this happening ? can you tell me ? Sorry, had to censor your phone number. I’m sure Lazada has availability, have you tried searching for it? I need a lazada in thailand in english url! Is the above link not working for you? I live in USA i want to order Thailand becauty stuff and clothes skin care ect. my last order was 2 bankpower but I can not recharge. so how i can I change or give back. That’s valuable info, thanks for letting us know your experience! I ordered GPS sat nav for Thailand. Delivery was quick, but no Thai map, only maps for other countries. Can I exchange it? Is there anyway to ship to USA? I am a buyer in Los Angeles, CA and desperately want to buy samples. ASAP. Please any help with this would be appreciated. On August 24, I ordered a clamp multi-meter, arrived a few weeks later, found out that the description of the unit was not correct, wanted to return the unit. Asking Lazada to whom to return the unit to the supplier or Lazada. Had to ask this because it was my first order and the paper in the package was very poorly printed! send a reminder about 1 week later, now it is October10, 2018, still did not receive an answer, however there was a message saying it was noted and the money was registered in the computer. I never received an answer on my question, and the unit is still there. Mid September I received a message from a Mr. Moskow (Lazada) Head of the sales department, asking my opinion about Lazada and if I was satisfied with Lazada. My answer to him was: I wrote the whole story and told him that I left it to his own imagination how he would call this! FARANG CUSTOMERS. Because I ordered in the past through my wife and daughter and this worked well!! Today I attempted to pay for an item but my two Thai debit cards and my UK Credit and debit cards were all refused. I’m not going to bother to try again. Incidentally COD is not possible as my condo management will not help. I would like to use Lazada but imposible to get it in english while I live in Thailand. Have fownloaded the app in english but all of the navigation is in Thai language. It been like this for more tha one year. When will the real english version be launched?